There are many things about fatherhood that are worth looking into. 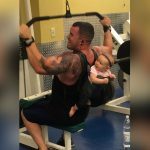 Being a dad is a privilege and also a lot of fun in most cases, but it is also very difficult because you need to give your best and be consistent in what you do. You are well aware of that if you already have kids, but if you have yet to become a daddy, the following list would definitely give you an idea about what to expect! Well, kids accept the world differently and we need to deal with that! This means that you need to be patient in all kinds of situations. When your kid tells a story, it becomes a situation because it could go on forever! And just when you think it is almost over, the kid decided to start again! 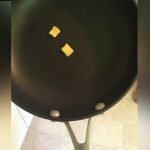 This may not seem like much, but it is one of those things that could make parenthood bearable! In fact, such moments are even inspiring and it all depends on the way you look at the situation. In this case, the newly-invented term is hilarious but also accurate and we guess we would use it every day, too. It is more than certain that toddlers are not to be left alone under any circumstances. If you decided to leave a certain task for them to complete, you are probably not going to see some kind of result. In fact, you would be in for additional work. This example shows what we mean. It is almost impossible for a kid to put their shoes on in the correct order! We genuinely believe that sometimes parents want to escape their reality and they try to find all sorts of fast and easy ways to do it! 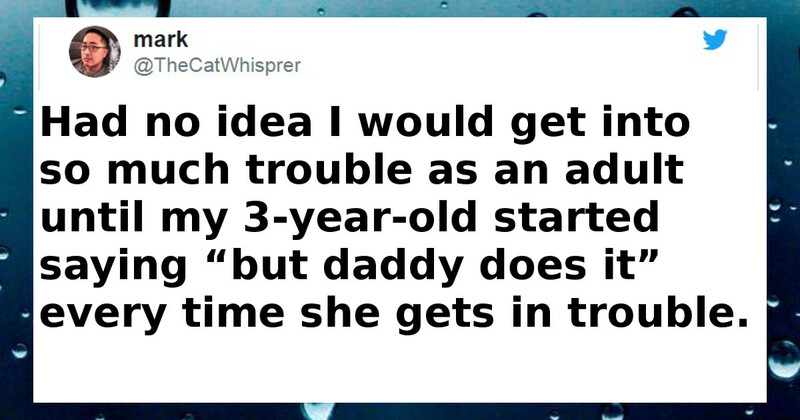 When we saw this tweet, we immediately realized that probably every parent has tried this at least once! Having noisy kids is something you could hardly change. Sometimes kids definitely act like they are living in a fairytale and they are not just any of the characters in that fairytale! They are the kings, queens and princesses, of course! And as most members of the high society, they need servants! Of course, this is real life and the parents play the role of the servants! Well, sometimes people might find it hard to understand their kids, especially when it comes to the moments when toddlers overreact about certain things. In this case, the toddler had no reason to use even a single Band-Aid, but we guess it is fun sticking them on your skin if you are a little kid! Part of every parent’s responsibilities is to make sure their kid’s respect them enough so they could listen to them. The father figure is usually respected but when kids reach puberty, things change dramatically! In this case, one father described his relationship with his daughter who is far from puberty but acts in a similar fashion! Kids nowadays grow up in a completely different environment than the one we were used to twenty years back. 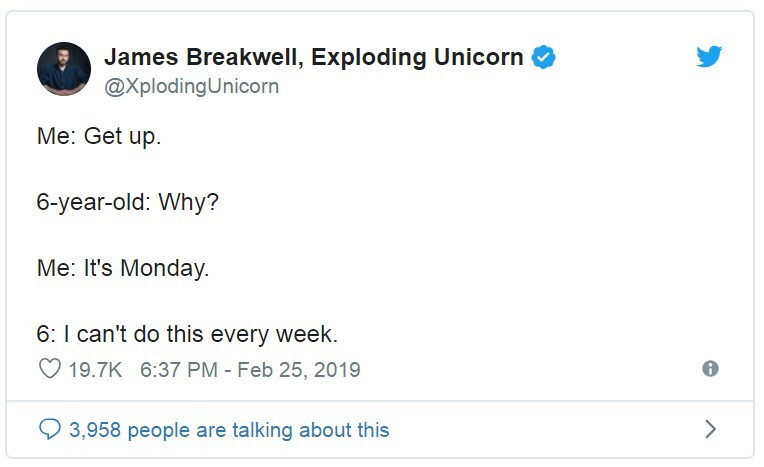 Technology introduced a new way of living and kids adopt it from an early age, but they still seem to struggle with things that are far less complicated than using some tech gadget and this tweet perfectly describes it! He sure found a funny way to describe the situation. We all know that most kids are not that excited to get up early in the morning in order to go school on time, so their parents need to rush them minute after minute. Children do not care that after taking them to school, their parents need to go to work as well. 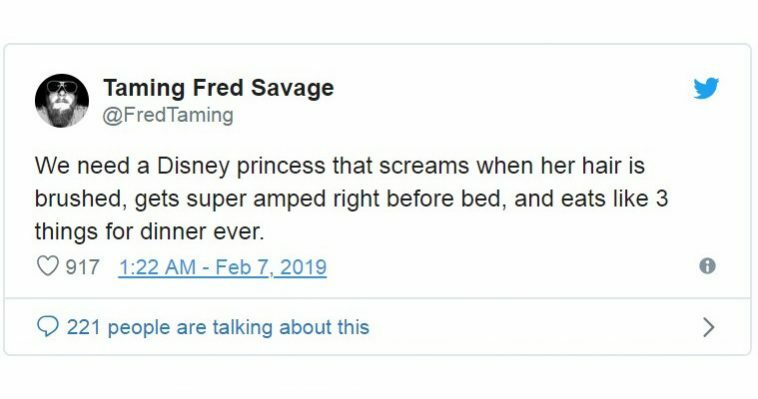 Well, if you have ever wondered what it takes in order for you to put a kid to sleep, this tweets pretty much explains the mechanism behind this operation. It requires patience and you probably need to be at least a bit stubborn in order to endure until the end when the kid is finally asleep. But you need to remember that the next day you need to go through the same thing all over again! Most kids actually complain about the home cooked meals their moms serve them, but we have never seen a kid complain about frequent pizza dinners! This is every kid’s dream, actually but most parents try to teach their kids to avoid fast food. It is strange to see a self-conscious toddler and there is no wonder why this dad was left speechless! It is fairly easy to explain the relationship between a father and his toddler. 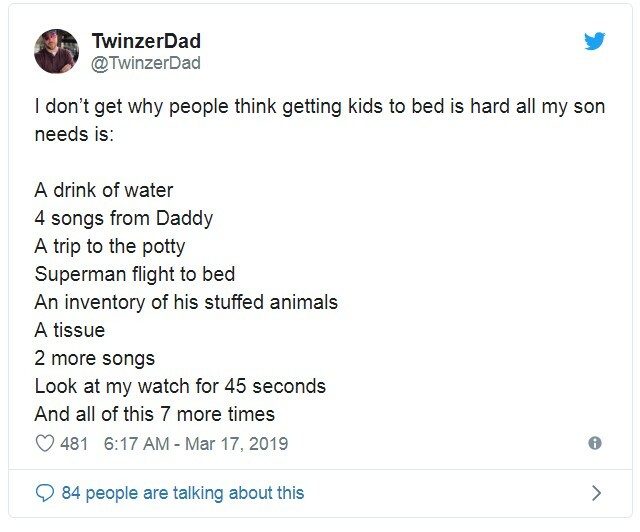 When trying to find the perfect comparison in other to make it more relatable, this dad absolutely nailed it and we laughed when we saw his tweet. This is so accurate that every single parent would probably immediately relate to it! We have said this numerous times before, but we will say it one more time – kids live in their own world and they often have no regard for the real one where all the adults live. 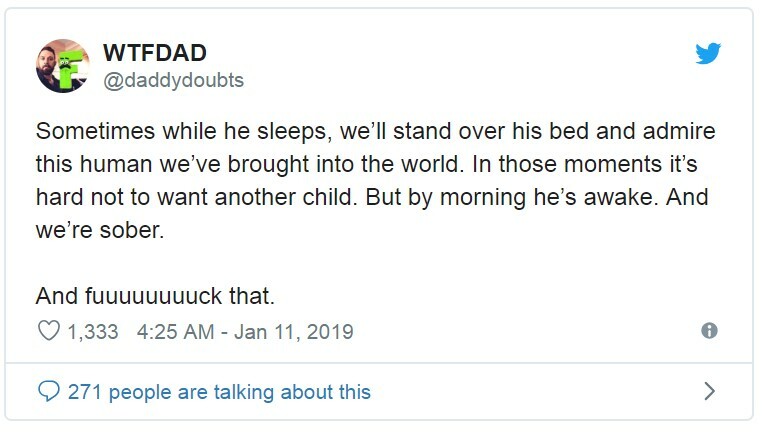 in this case, one kid refused to get up early in the morning every week, but this is about to change once the child becomes an adult. We do need to get up early every morning, and most of us don’t like it one bit. This is the circle of life, we guess. Until the moment you become a parent, you are free to have as much alone time as you want. You can also do the things you love the most and enjoy wasting your time with doing nothing, which is the ultimate way to relax. When a kid comes along, you can simply forget about all of that and accept that you are not in charge of your time anymore. People say that having a child is the greatest joy a person is ever going to experience in their life, and we guess that this is true. Of course, it comes at a price, just like anything else in life. In this man’s case, the price is losing sleep, and most of the other parents would probably mention the same thing if asked. It is all worth it, of course! Something that we are all aware of is that boys will be boys no matter of their age or social status. There is always something that could make any man feel like a schoolboy again, and this tweet proves it! As you can see, the father wanted to do the right thing, but his son had something for him that he could not resist! We already mentioned that after you become a dad, your free time immediately disappears and all you are focused on is raising the kid and taking care of the family. This results in literally no social life at all, and the constant invitations you receive to hang around with friends are something you would like to say ‘yes’ to but you simply cannot do it. If you ever thought that teachers need to be paid more, then you definitely have a point! They should be paid extra because they need to put up with naughty kids on a daily basis! 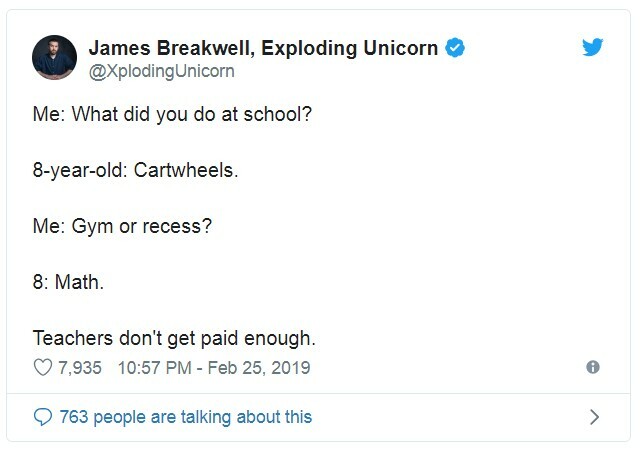 Having a student doing cartwheels during math class is definitely not the type of thing everyone could deal with! Every parent would agree that the only time a kid behaves well is when the kid is sleeping! In most of the other moments things are really over the edge, as every toddler is more or less naughty! As you could imagine, most parents would strongly relate to this tweet because they probably feel the same way. It is wrong to think that a toddler is not able to manipulate a parent! They are actually really good at doing so and in some of the cases they can even transfer the blame for something they have done, just like this tweet suggests! 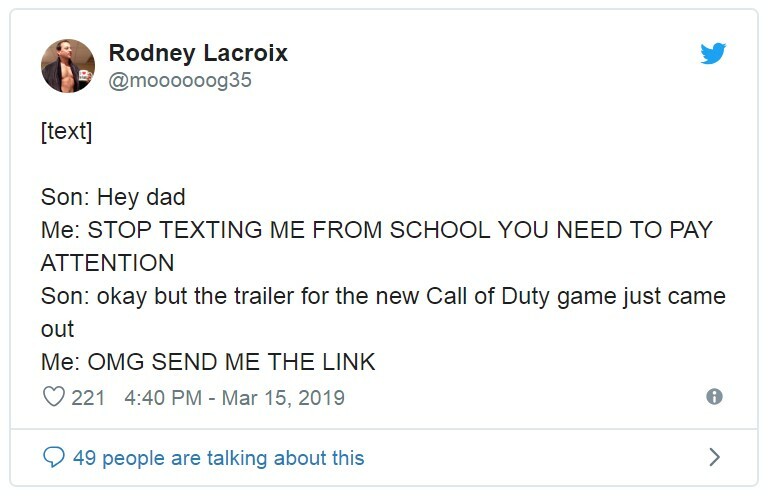 Poor dad!